Analysis of your pasture growth data will help you plan the most profitable renewal programme. While you may instinctively know your best and worst paddocks, without measuring or assessing pasture growth paddocks cannot be accurately ranked to identify worst performance. Identify the poorest producing paddocks. Compare those to the best performing paddocks to assess potential. Identify why these paddocks are the lowest producing. The best paddock(s) to renew are the poorest producers as these have the potential for greatest improvement. For example, where the yield can be increased by 2t DM/ha the return is around 130kg MS/ha. The return will be greater if the extra growth occurs at a time of the season when animal demand exceeds pasture growth. The highest producing paddocks on a farm indicate the property's overall potential. Under-producing paddocks highlight the opportunity for extra pasture growth. Use grazing and yield records to identify your best and worst paddocks. The more measures and assessments you have to compare the better (and easier) the decision will be. If records are unavailable use the Pasture Condition Score Tool and walk your farm at least six months before sowing date. Use a rising plate meter or visual yield estimates from farm walks to estimate pasture to calculate paddock growth. Software programs such as Pasture Coach and MINDA Land & Feed can be used to calculate paddock growth and provide paddock profiles. Analysis of good grazing records can give a clear indication of paddock ranking. With good grazing records the performance of individual paddocks can be calculated by adding up the number of cow grazing days over the year. To calculate pasture eaten per paddock use the attached form. A simple collection of the number times paddocks have been grazed can give a quick indication of paddock growth as illustrated in the table below. * Total grazings/ha calculated my be quite different from the figures in this example because they depend on the number of paddocks on the property. What is important is the different between the paddocks. At the end of the season, grazings for each paddock can be added up to identify total grazings. Include other growth such as silage made. Where the paddocks are different sizes, divide the total grazings by the paddock size, so you can compare total grazings/ha. In this simple example paddock A is carrying 25% more stock than paddock B, and twice the stock of C.
On many farms the worst paddock only produces half as much as the best paddock as shown in the diagram below. In this example paddock 3 has the potential to grow an extra 6 tonne DM/ha/year while paddock 16 an extra 9 tonne. 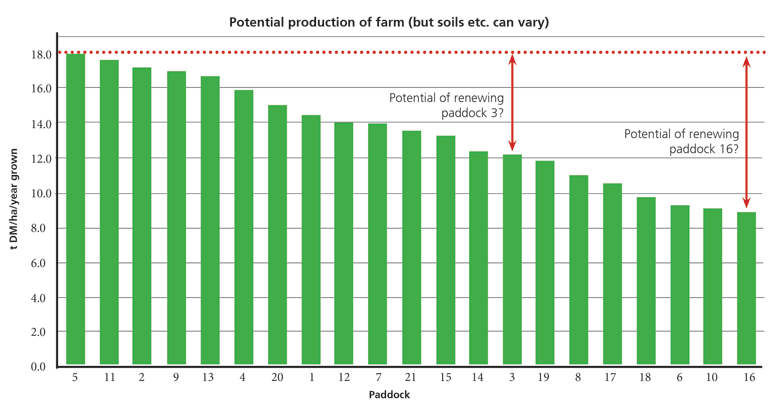 In other words the best paddock (5) is producing twice as much as the worst (16). The trick is to know which paddocks are the poorest producers. Introducing new plants will not increase production if you do not resolve the underlying causes of low pasture production - treat the cause and not the symptom. Click on the expanding items below for solutions. Test soil for pH and nutrient deficiencies. Apply fertiliser or lime as necessary. Improve drainage or change wet weather management, e.g. build a feedpad, on/off grazing. See Limiting pugging and compaction damage (Farmfact 5-40). Soil compaction can occur, particularly on heavy (clay) soils, where pugging or repeated treading in wet conditions has occurred. This is tested with a spade digging several holes through the paddock. There are various signs of compaction. First, you can feel compaction, or a compacted layer or pan, when digging. If unsure dig a hole in a good pasture and compare them. Compaction can also show up through shallow rooting, or sometimes roots reaching a pan and moving horizontally. In summer compaction can show up through ‘plant pulling’ in a pasture (although this can be caused by other factors including pests). Change management practices (e.g. OAD, stocking rate, calving date, on/off grazing). On many New Zealand dairy farms in summer dry areas, pasture persistence is severely compromised by a combination of heat and moisture stress, pest pressure and over-grazing. Of these over-grazing is the one factor that can be controlled, and changes to the farm system should be considered to minimise overgrazing and improve future pasture persistence. These include policies around stocking rate, calving date, OAD milking, drying off, pasture species, cropping and supplements. At a tactical level a major change is on/off grazing, where during extended dry periods stock graze down to the desired post-grazing residual, but are then removed from the paddock to protect that pasture, onto a feed pad or sacrifice paddock or similar. Apply herbicide as required. Use a crop to break insect cycle; use treated seed (endophyte) or granular insecticide at renewal; insecticide at later stages. For more information on common insect pests click here. Choose the right cultivars to maximise the profit gained from every hectare of new pasture sown. This tool is used for ranking paddocks one to five based on the extent of pasture damage.